As the world’s largest rooftop farm, Brooklyn Grange has been super busy for the last three years providing the local community with delicious fresh vegetables. 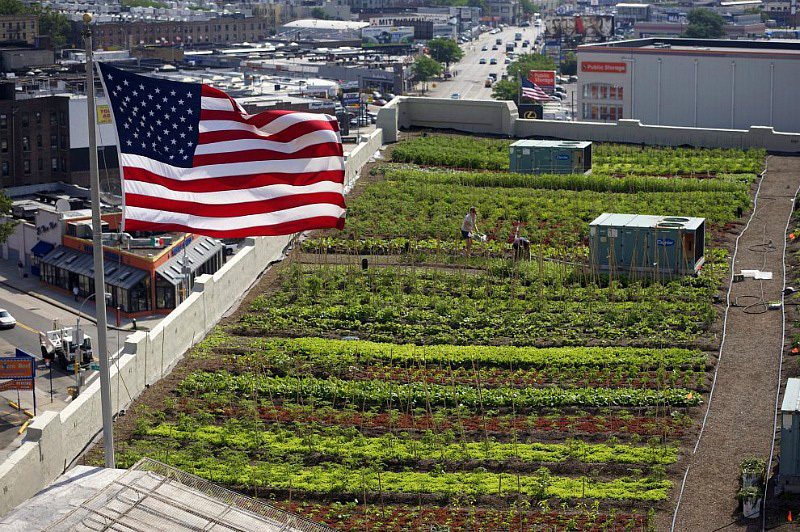 While their 40,000 square foot space atop a warehouse in Long Island City has been enough to grow more than 40 different types of vegetables each year, Brooklyn Grange is in the process of expanding to a rooftop in the Brooklyn Navy Yard. The new food-producing plot is larger than their current farm, and it is expected to be up and running by this summer. Hit the jump for a look at the space! When we posted yesterday, we only knew of the new space through a tweeted picture, but now the Brooklyn Grange has added more photos of the new rooftop to their Facebook page, giving us a much better look at the space. The new rooftop is more than 45,000 square feet, which means that the world’s largest rooftop farm is more than doubling in size! No doubt, the new location will let the Grange become highly involved in the immediate local neighborhoods, a characteristic of most organizations in the Navy Yard. The Grange farmers have mastered the art of urban rooftop agriculture, growing their organic produce in 7.5” deep beds with Rooflite soil, and we can’t wait until this massive rooftop is lush with produce! As the world's largest rooftop farm, Brooklyn Grange has been super busy for the last three years providing the local community with delicious fresh vegetables. While their 40,000 square foot space atop a warehouse in Long Island City has been enough to grow more than 40 different types of vegetables each year, Brooklyn Grange is in the process of expanding to a rooftop in the Brooklyn Navy Yard. The new food-producing plot is larger than their current farm, and it is expected to be up and running by this summer. Hit the jump for a look at the space!